For about a year and a half Zynga has experimented with occasionally selling virtual goods for charity. But they’ve been criticized in the past for sometimes keeping up to 50% of the “donation.” Some have criticized Zynga for pulling at people’s heartstrings over issues like the Haiti earthquake, and then keeping part of the money. Much of the criticism was over how the details were messaged. And others have defended the program since at least some money went to good causes. How much money? That isn’t clear. 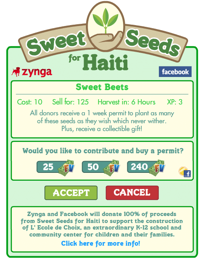 But Zynga raised $1.5 million to build a school in Haiti through promotions on Farmville and Mafia Wars. 100% of proceeds were donated, and $200,000 of that was directly from Zynga, says the company. They also covered credit card fees. In fact, most or all of the most recent Zynga.org charitable efforts have been 100% donations, says the company (although we’re not sure if Facebook keeps its 30% cut for Facebook Credits or not). We hear, but Zynga hasn’t confirmed, that all future charitable efforts will be 100%, and that Zynga will no longer keep a cut on any of these programs.